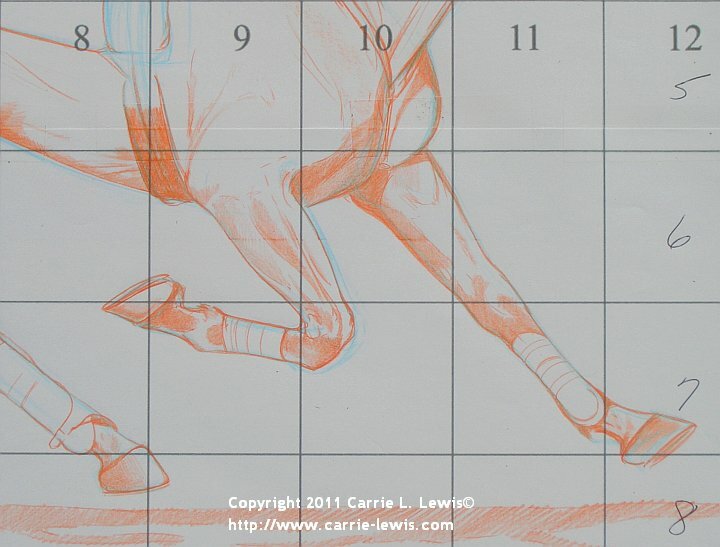 Knowing how to draw horse legs and feet accurately is as important as drawing an accurate likeness of the horse’s head. Especially if you’re a portrait artist. Why? BA horse’s feet are nearly as distinctive to each horse as human fingerprints are to each person. 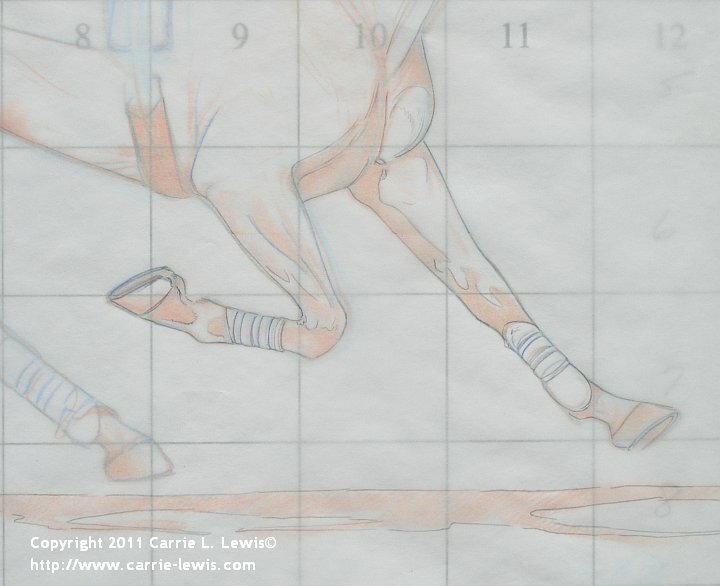 Bone structure, body type, and genetics all play a role in the shape of the natural hoof, how it strikes the ground, and it’s position throughout the stride. In other words, there is no such thing as a one-size-fits all foot for the artist who is interested in painting individual horses. For the longest time, all my horses appeared in tall grass or water or were painted or drawn in poses that didn’t require feet. I hated drawing feet because I could never get them right. Hopefully, this tutorial will help you find the same enjoyment in producing a solid, believable foot. Drawings are developed through a series of stages beginning with a full-size grid drawn or printed on drawing paper. I try to make the squares as large as possible and still retain the ability to capture finer details. Step 1-3: Getting the basic shapes on paper. 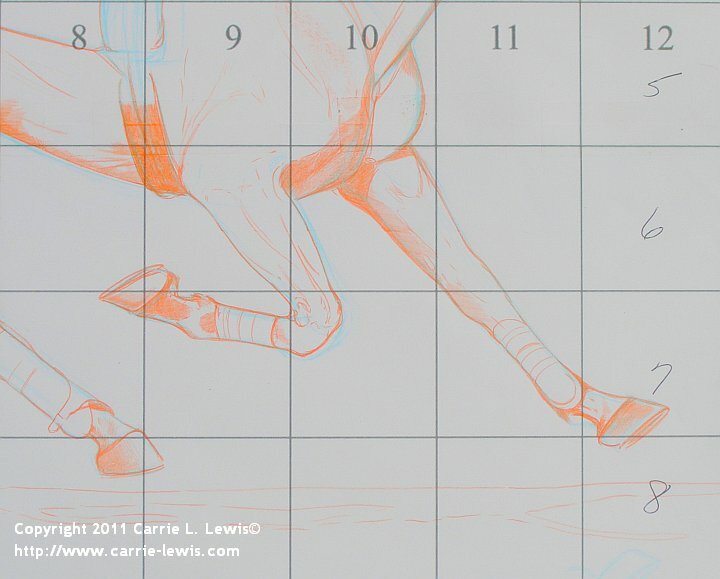 In the illustration above, we’re looking at the third step in the drawing process. The grid was printed on drawing paper and the first stage of the drawing was done in Verithin Non Photo Blue pencil. That shade of blue doesn’t photograph very well, but it’s ideal for the first phase of drawing because it’s easy to erase and easy to work over. At the blue stage, my goal is placing the large shapes in the correct sizes and positions on the paper. 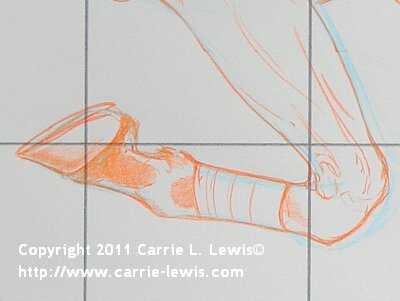 For the next step, I used Prismacolor Vermilion Red/Pale Vermilion to begin fine-tuning the lines. I worked throughout the drawing, reshaping and re-positioning as necessary. Step 4: Making corrections as needed. The flexed front leg is one step beyond. I stopped using the reference photo with the grid and relied more on the enlarged (11×14) original photo at this stage. I’m still correcting the line drawing, but I’ve also begun establishing shape and contour by adding value. I keep the values light even at this stage, because I am still drawing. But I had drawn this foot in profile based on what I could see in the gridded 8×10 photo, and when I looked at the enlargement, I realized the foot is actually tipped outward so the shoe and a bit of the sole of the foot is visible. That required redrawing that area. I also noticed that the shin boot doesn’t cover the fetlock on the outside, so I had to correct that area. To keep the lines and shapes in correct order, I added the shading. 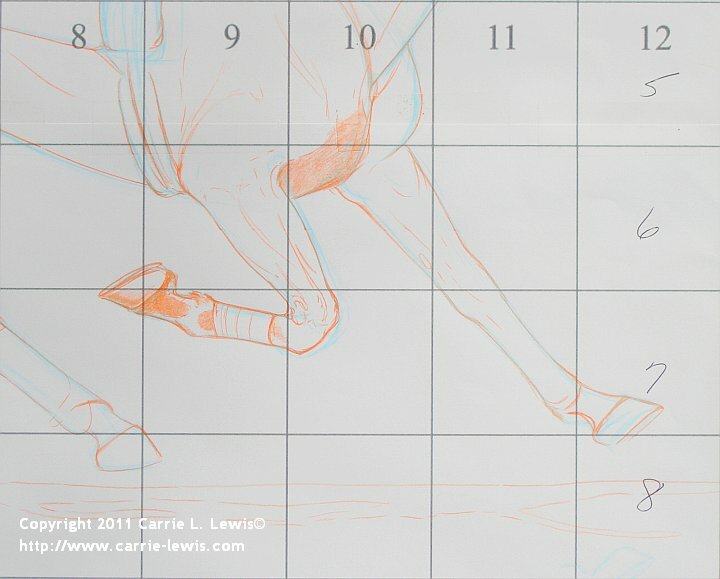 The image below gives you a better idea of how the leg took shape through the first four phases of drawing. NOTE: I haven’t bothered to erase previous lines. The drawing is built on each phase of work and unless there’s a major error, no erasing is done until the final version. Step 5: Refining the drawing and adding details. Once the drawing is in place on the paper, the process becomes a matter of refining the shapes and adding detail, one layer after another. I defined the details in the two extended feet. The shoes have been drawn and I’ve added shading to the hooves to give them mass and shape. I also shaded the fetlocks on both legs and, although you can’t see it, I shaded into the upper legs. 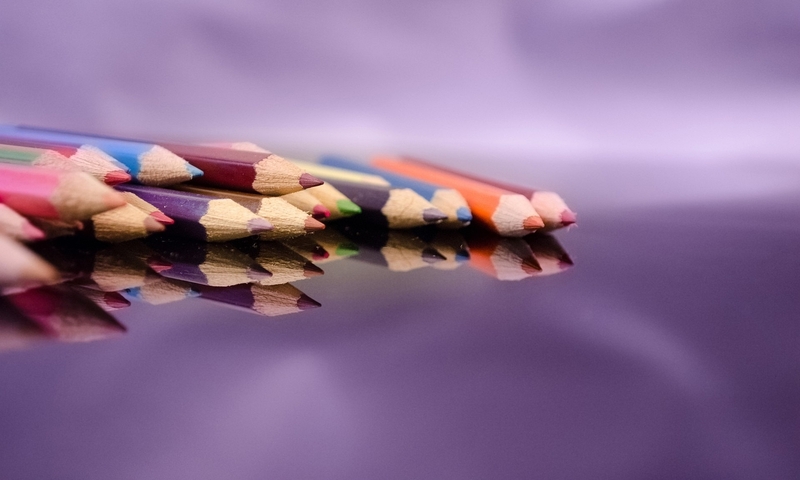 As in the previous step, pressure is kept light and the color layer is thin and light enough to be erasable. 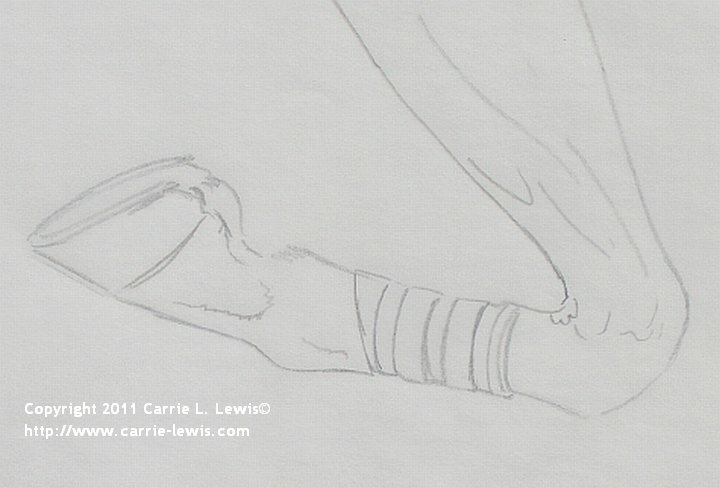 Step 6: Adding darker values to further define the legs and feet. In this step, I started adding darker values. Technically, I’m still drawing, but because the lines between highlights and shadows can get confusing, shading helps establish those edges more clearly. Take note that the hooves are unique shapes. The two front hooves are very similar shapes, but the angle of the foot changes the shape. The back foot is not the same shape. This horse has a blockier back hoof. Because this is a portrait of a specific horse, I’m taking special care to draw each part the way it appears in the reference photograph. Step 7: Transferring the drawing to fresh paper. When the original drawing is as finished as I can make it, it’s time to lay a fresh sheet of tracing paper over the drawing and make a new one. This will be the drawing I photograph for the client if they get an electronic proof, so it needs to be as clean and crisp as possible. If they’re getting a full-size physical drawing, this will be the second to last step. The client drawing will be the final step. The photo above shows the front legs and the cast shadow drawn on the new sheet of paper. I work through each area carefully, making sure the line is crisp and dark enough to photograph. Accuracy is of major concern so even at this point, I continue to compare the drawing and the reference photograph. I take measurements if necessary, and erase and make changes as I go. Because this is a pretty intense part of the process, I tend to work in short sessions. I work standing up, so my legs and back need frequent breaks. So do my eyes. It’s better to work in shorter sessions than to push through a long session and risk getting impatient. Mistakes happen in moments of impatience. It’s best to avoid them. No drawing is ever complete until the painting is finished. Tweaking continues until the signature is in place. But a good drawing provides a clear road map for the painting. With a paid portrait, it also gives the client an idea of the composition of their portrait. The finished portrait for this tutorial was an oil painting, but this drawing method is a good way to start any project in any two-dimensional medium. It’s also a great way to improve your skills at drawing any horse. Or any other subject, for that matter. I’m glad to hear that, Nannette! Keep up the good work!